LEXINGTON, KY. (March 29, 2017) - The Kentucky Horse Park, along with state and local officials, today launched a season-long celebration honoring the 100th birthday of Thoroughbred legend, Man o&apos; War, who was foaled on March 29, 1917. Man o&apos; War went on to become one of the foremost racehorses of all time, as well as one of the most famous Kentuckians. The Man o&apos; War Celebration, presented by Windstream, will honor the life and legacy of this great horse throughout 2017 with a series of special events at the Kentucky Horse Park and throughout Central Kentucky, as well as with a unique museum exhibit entitled Man o&apos; War: The Mostest Horse That Ever Was. "Man o&apos; War is a Kentucky legend, he thrilled fans with never-seen before feats of speed and power. Nearly 70 years after his passing, the lure of the Thoroughbred has never been stronger," said Don Parkinson, Secretary of the Kentucky Tourism, Arts and Heritage Cabinet. "We invite fans from near and far to come celebrate Man o&apos; War, here at the Kentucky Horse Park and throughout the Bluegrass." 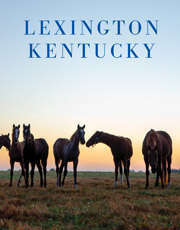 "This is an opportunity for Lexington, the Horse Capital of the World, to celebrate one of the world&apos;s greatest horses, Man o&apos; War," Mayor Jim Gray said. "We have young people who think Man o&apos; War is the just the name of a road. They need to learn about one of Kentucky&apos;s outstanding athletes." Foaled not far from the park at Nursery Stud Farm, Man o&apos; War came along as World War I was raging in Europe, giving the inspiration for the colt&apos;s impressive name. He won 20 of his 21 starts and was undefeated as a three three-year-old breaking track, American, or world records in seven of his 11 starts. His incredible power and will to run made him the greatest racehorse in American history. "What an incredible opportunity to highlight a racing legend and equally to engage our community," said Laura Prewitt, Executive Director of the Kentucky Horse Park. We are delighted with all of the area businesses that have stepped up to support the Man o&apos; War Celebration and in particular we would like to thank Windstream for being the presenting sponsor. They are a great community partner and we hope the events we have planned this year will encourage visitors of all ages to experience all that the Kentucky Horse Park has to offer." "The Man o&apos; War Celebration is a testament to the deep-rooted heritage and vibrant culture of Kentucky," said Barry Bishop, Regional VP of Operations, Windstream. "We are proud to partner with the Commonwealth of Kentucky and the Kentucky Horse Park as we honor and celebrate this historic occasion alongside the Lexington community." The Man o&apos; War exhibit in the International Museum of the Horse will share artifacts, photos and a timeline showcasing his illustrious career as a racehorse, a sire, and of his life in the Bluegrass as one of the state&apos;s most well-known and best visited residents. Additional events are planned throughout the season to celebrate Man o&apos; War&apos;s enduring legacy for Kentucky residents and visitors from around the world. A current list of Man o&apos; War events can be found at www.ManOWarCelebration.com. The Man o&apos; War Celebration, presented by Windstream, will end with a public invitation to join the park for a re-broadcast of Man o&apos; War&apos;s funeral on November 1, the anniversary of his death. Upon Man o&apos; War&apos;s death at the age of 30 in 1947, he was laid to rest at Faraway Farm, in Lexington, where he had stood at stud for most of his life. Later he was moved to the Kentucky Horse Park just prior to the park&apos;s opening in 1978, along with his statue by Herbert Haseltine and his famous offspring including 1937 Triple Crown winner, War Admiral.